Finally, this wonderful animated series that I grew up on is now available on DVD! Having every episode in one, comprehensive collection only adds to this release's appeal. Growing up as a rabid comic book fan of the 80�s, I was fully aware of Marvel�s dominance over DC Comics during that decade. Of course it didn�t help that Marvel�s Secret Wars series, one of the best-written collections in comic book history, came out during the decade while many of the DC superheroes were still wearing brightly-colored uniforms that didn�t exactly ooze with machismo. Plastic Man was one of those DC heroes that wore a bright-red uniform, and was considered by many to be a poor man�s Mr. Fantastic from Marvel�s Fantastic Four series. 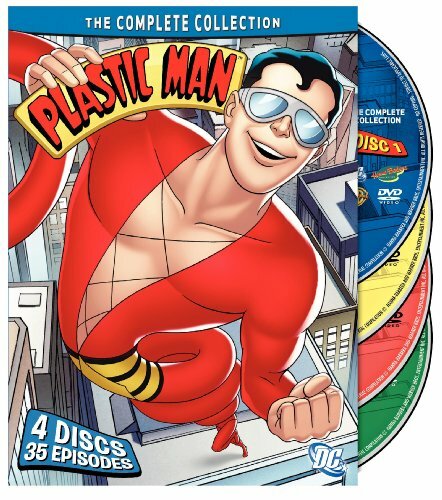 Still, this rubbery guy did get his own TV show, which Warner Home Video has decided to offer up on DVD in the comprehensive Plastic Man: The Complete Collection. This 4-DVD set compiles all 35 animated adventures that aired on television from 1979-1980, albeit not in the order in which they aired. Compared to today�s flashy animated fare, Plastic Man is beyond pedestrian, but, for myself, and other children of the late 70�s and 80�s, there�s plenty here to like and be nostalgic towards. The first episode in the set is the oddly-titled The Weed, where Plastic Man battles an evil plant that has the same qualities as his human enemies. From there, we get to Dr. Irwin and Mr. Meteor, an episode featuring a nerdy, weakling doctor who is transformed into a powerful nemesis thanks to his contact with a meteor. Wham Bam, Beware of the Clam, The Day the Ocean Disappeared, The Horrible Half-Ape, and Hugefoot are standard, by-the-numbers episodes, but The Miniscule 7 is one of the better efforts from Disc 1, as seven tiny gangsters do the unthinkable and enter a basketball tournament. Plastic Man soon realizes that these tiny hoopsters are up to no good. Moonraider, Superstein, and Dog Master round out this first disc. Disc 2 begins with Diabolical Dr. Dome, an episode where the evil titular character finds a way to take Plastic Man�s powers from him. Of course, doing this allows Dr. Dome to pull off numerous thefts, while laying the blame on Plastic Man�s formerly stretchy shoulders. Honey Bee is another of those throw-away shows, but The Dangerous Dr. Dinosaur is another good, simple tale of Plastic Man�s battle against a bank-robbing dinosaur. The Spider Takes a Bride finds the title villain turning all of Queen Katherine�s followers into flies until she marries him, but with plastic man as her bodyguard, she has a fighting chance of staying single. After Empire of Evil, we get a pair of zany, fun episodes in The Corruptible Carrotman and The Maniacal Computerhead. Both of these, along with The Hippotist, showcase some of the best villains the series had to offer. Disc 2 comes to a close with Badladdin and Toyman. In Disc 3, Ghostfinger is hell bent on getting revenge on those who sent him to prison. His grand plan involves building a time machine to enlist the aid of other ghosts from the past. Nothing noteworthy happens in Highbrow and The Kitty Katt Caper, but in The Colossal Crime of Commodore Peril, the villain targets three billionaires, and only Plastic Man can come to their rescue. Next up, we get Terrible 5+1, Joggernaut, and Dr. Duplicator Strikes Again, followed by Thunderman, the story of the title character, who�s stolen New York City with intentions of selling it to the highest bidder. The last two episodes on this disc are Count Graffitti Meets Plastic Man and Sale of the Century, while the fourth and final disc houses a mere five episodes. The first of these is Plastic Mummy Meets Disco Mummy, which brings Plastic Man to Mexico, where he�s turned into a mummy by a resurrected ancient Aztec Queen. The next three are City of Ice, Plastic Man Meets Plastic Ape, and The Crime Costume Caper, and finishing off this collection is The Royal Gargoyle Foil, where the Gargoyle sets out to steal an invisible ray machine from Doctor Ventor. When Plastic Man gets involved, it�s a safe bet that Gargoyle�s plans will be thwarted. The audio and video quality throughout this set is pretty much what you�d expect from a 30-year-old animated TV series, but things look and sound surprisingly good considering their age. There�s also some nice extras spread across the four discs, most of which take a look back at the series and Plastic Man in general. This set is a no-brainer for those of us who grew up with animated gems like this nice piece of nostalgia.